Most homes in the city have a water pressure of about 60psi from their taps. But if your water supply comes from a well, or you live in a rural area, you’re likely to have less. Then watering the lawn becomes a challenge. But the best lawn sprinklers for low water pressure make the most of below-average flow. And there are several kinds available. You can choose from in-ground or above-ground fixed or rotary spray, bubblers, spot sprinklers, or drip irrigation. Which type is the best for your yard? When shopping for fixed spray heads, there are two things to consider. Everyday life can be hard on an in-ground sprinkler. Be sure to choose ones that retract well and don’t clog easily. Next, think about the shape of your lawn and whether you’ll want 90, 180, or full-circle spray heads. Some like the ones from Rain Bird will allow you to alter their patterns between zero and 360°. Rain Bird’s 1802VAN pop-up sprinkler heads are popular and well-liked. Plus, they offer a high level of customization. For example, they are available in two-inch, three-inch, four-inch, six-inch, and twelve-inch sizes. Plus, it’s possible to adjust the spray distance and the angle. On the two-inch version, the spray adjusts between 8 to 15 feet. Then the angle adjusts anywhere between zero and 360°. There’s even a left-edge indicator to make placement easier. Moreover, the sturdy construction and stainless steel spring retract the head flush to the surface every time. And the tapered head with a mesh filter prevents clogs from grass clippings and debris. But should you need to perform maintenance, you won’t need special tools. Toro’s 53813 pop-up fixed-spray sprinklers waste less water because they don’t flush at startup. While they aren’t as adjustable as the ones above from Rain Bird, they are durable. The four-inch heads offer a 15-foot spray radius in a half circle pattern. The recommended operating pressure is between 20 to 50 psi. And even if you mix and match different pattern and radius sprinklers, the precipitation rate stays the same along the system. Rotary nozzles can function as pop-up sprinklers. Instead of spraying at a fixed angle, the heads rotate. Most models will allow you to prevent overspray by adjusting the radius. Rain Bird’s 2045PJ MaxiBird system has a heavy-duty construction with double -weighted arms to slow their rotation and increase how far they spray. You can adjust the arm spring to accommodate low pressure and minimize water use. Each head requires between 25 to 60psi to maintain a radius between 22 to 45 feet and a precipitation rate between 0.28 to 1.21 inches per hour. If you reduce the flow, the radius shrinks to 18 feet. Moreover, if you don’t want the full 360° coverage, you can reduce it down to only 20°. The Rain Bird 22SAQ Mini Rotary sprinklers are small but mighty. They pop up to 4-inch height to spray out to 24 feet. But their gentle 0.6 inch per hour distribution rate is perfect if you need to take it easy on a hillside or new plantings. While this model sprays in a 90° quarter circle pattern, you can get these same compact sprinkler heads with different capabilities. For example, some have fixed 180° or 360° patterns, while another allows you to adjust between 45 to 70°. Rain Bird’s R-VAN1724 rotary nozzles are simple but effective. You can quickly adjust the radius between 45 and 270° by simply pressing down on the nozzle and rotating it. Plus, you can alter the radius between 17 and 24 feet. Bubblers are best for small areas like flower beds or vegetable gardens. When they’re working, they look like small individual fountains. These Rain Bird compensating bubblers maintain constant water flow even at only 20psi. They use as little as 0.25 gallons per minute. The advantage of this slow trickle is that water absorbs as it is needed. These bubblers operate in a full circle pattern. They come with a filter screen to prevent clogs. And they can be mounted on half-inch male risers to reach higher areas. Orbit’s mushroom bubblers have a screw top that allows you to vary the flow from a trickle to a flood. You can use them singly or as part of the system. Each bubbler head comes with a half-inch thread connection so that it can be mounted on risers. And the sturdy plastic build features a debris filter. Instead of an entire irrigation system, sometimes all you need is a spot sprinkler. But not all are created equal. Some perform better than others when the water pressure is low. The Dramm 15072 ColorStorm sprinkler spends to distribute water over an area up to 38 feet in diameter. More importantly, it accepts pressure as low as 20psi with as little as 3 gallons per minute. The sprinkler emits fine droplets for improved absorption. In addition, its all-metal construction includes a heavy stationary base, and a brass spinning head mounted on a ball bearing. Plus, you can choose from six bright colors. The Melnor XT Turbo sprinkler has 20 tiny nozzles that cover lawns up to 4200 ft.² in size at 60psi. Conversely, you can water up to 3700 ft.² at 40 psi, or 2800 ft.² at 20 psi. The sprinkler’s TwinTouch feature lets you alter the range and size of the watering pattern. To illustrate, move the yellow tabs to zoom in on a small flower bed or increase the area to cover as much of the lawn as possible. The SOMMERLAND spot sprinkler comes in either a two-piece or three-piece set. Each sprinkler head attaches to a standard garden hose. And each one covers up to 30 feet in radius. The Gilmour spot sprinkler waters a rectangular pattern up to 15 x 30 feet. It produces a gentle spray and performs well with low water pressure. The best way to distribute water when you have very low pressure may be with drip irrigation. The water will slowly seep into the ground instead of being lost to evaporation or in the wind. Rain Bird’s Drip Irrigation Kit covers up to 75 square feet. It’s not the best option for watering the lawn. 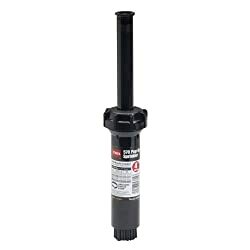 But it’s perfect for irrigating a garden or flowerbed. It conserves water and prevents runoff, too. You won’t need to dig to install the system because it’s all above ground. You can add a timer or other controller and hook it all up to your outdoor faucet. The .09 gallon per hour emitters need to be spaced every 18 inches to ensure proper coverage. Moreover, the emitters and the faucet connection regulate pressure so that all the plants receive even amounts of water. You’ve now seen that there are several smart irrigation options for watering your yard. But how do you know which one is the best for your needs? The easiest way to begin is to understand what your lawn needs. Here are some questions to get you thinking. Do you have grass or foliage that requires a lot of water or a little? What type of soil do you have? Will it soak up water quickly? Here are the reasons behind these questions. First, lawns with Kentucky Bluegrass will be thirstier than those with St. Augustine. And loamy or sandy soil will absorb water faster than clay. Next, slopes can create a problem with runoff, so it’s better to give them a low flow. But the wind is also a factor as the mist from sprinklers might not reach its target. Once you are familiar with what your yard requires, it’s easier to choose between sprinkler types. If you have a small lawn and your climate is humid, a portable sprinkler is an inexpensive choice. It does mean that you need to be actively involved in moving it around. And you may waste water if you don’t test to see if you’re providing even coverage. But it’s straightforward to check how your irrigation is working. Just place a few cups or bowls around the yard. After you finish watering, see if there is close to the same amount of water in each of them. On the other hand, if you have a large lawn or live in a dry climate, permanent sprinklers are advantageous. Controlling them with timers is possible, just like with a portable sprinkler. Or you can take them to the next level with Internet-connected controllers. Moreover, you’re likely to conserve water with an irrigation system like this. Water conservation is vital even if you don’t live in an arid zone. Not only does it save money, but it also protects against the diseases associated with overwatering. When you water on slopes, consider installing drip irrigation lines if you don’t have grass to mow there. Bubblers are excellent for gardens and flowerbeds. You can also install either system in flower pots or a container garden. You probably already know that watering before dawn is better for your lawn. But did you also know that interval watering is better still? Instead of soaking the grass for an hour straight, try two intervals of twenty minutes. It will help your lawn and garden soak in the moisture better without becoming over-saturated. Low water pressure won’t stop you from taking care of the yard. Choose one of the best lawn sprinklers that perform well with 20 to 40psi, and you’ll find that the job is easy after all.